44 BC – Casca and Cassius decided, on the night before the Assassination of Julius Caesar, that Mark Antony should stay alive. 313 – Emperor Jin Huidi was executed by Liu Cong, ruler of the Xiongnu state (Han Zhao). 1381 – Chioggia concluded an alliance with Zadar and Trogir against Venice. 1489 – The Queen of Cyprus, Catherine Cornaro, sold her kingdom to Venice. 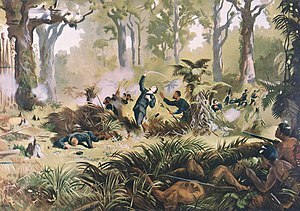 1869 – Defeat of Titokowaru. This entry was posted on Friday, March 14th, 2014 at 12:01 am and is filed under history. You can follow any responses to this entry through the RSS 2.0 feed. You can leave a response, or trackback from your own site. Of course to get there in the Balkans a lot of blood had to be spilled and American bombers deployed to crush those who would try and hold their State together and not let it be torn apart to be annexed by the new European Order – who haven’t quite absorbed it all yet. It was a shame that Russia was so weak then and couldn’t prevent their depredations but history never ends – the Lion doesn’t lie with the lamb yet.